Jon Cruddas, who’s now leading a comprehensive policy review, says he wants to renew the party’s roots in English radicalism. Jon Cruddas could have been a contender. In 2007, the MP from Dagenham in East London won the first round of the contest to become deputy leader of the Labour Party. Although he eventually lost to Harriet Harman, Cruddas’s call for Labour to reconnect with its grassroots and renew its core values, which he described as “hollowed out” after ten years in power, resonated powerfully within the party. Labour’s decisive defeat in May 2010, which ushered in a coalition between David Cameron’s Conservative Party and Nick Clegg’s Liberal Democrats, also put an end to Prime Minister Gordon Brown’s political career—and to the vicious sniping between Brown loyalists and the followers of his predecessor, Tony Blair, that had long paralyzed the party. Given this opening at the top, Cruddas’s decision not to run for Labour leader remains one of the mysteries of British politics. Instead, he threw his support behind David Miliband, an opportunistic move designed to lend leftist cover to the Blairite front-runner—but which, after David’s defeat by his younger brother Ed, seemed to consign Cruddas to terminal marginality. 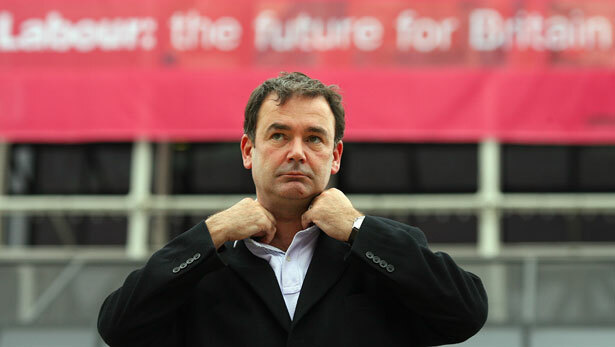 By 2011, Cruddas was so estranged that he ended up listening to Ed Miliband’s leader’s speech to the annual party conference—the centerpiece of the political calendar—on his car radio. Fast-forward two years, and Cruddas is now a member of the shadow cabinet, chosen by Miliband to chair the party’s comprehensive policy review. To the extent that politics is a battle of ideas, Cruddas has been put in charge of the armory. Just think of him as “Q” to Miliband’s James Bond. It was a popular choice—Cruddas is widely liked across most of Labour’s perennially warring tribes—and a canny move by Miliband as well. After a shaky start, the Labour leader has also become increasingly sure-footed in his dealings with Britain’s reliably hostile press. Miliband’s strong, and early, stand against Rupert Murdoch in the wake of the phone-hacking scandal showed a boldness and confidence lacking in his first months as party leader. Likewise his deft response to the death of Margaret Thatcher, in which he acknowledged the Iron Lady’s importance as a pathbreaker, not just as Britain’s first female prime minister but as “a woman chemist” at Oxford “when most people assumed scientists had to be men,” while at the same time underlining the devastation she wrought in office. “Mining areas felt angry and abandoned,” Miliband said. “Gay and lesbian people felt stigmatized” by the policies of a woman who, he reminded the House of Commons, had shunned Nelson Mandela as a terrorist. Yet Miliband’s apparent reluctance—or inability—to articulate a convincing alternative to the coalition government’s austerity agenda leaves him open to Tony Blair’s charge in April that he leads a party without policies, “simple fellow travelers in sympathy” rather than a credible government-in-waiting. Blair has always been ready with a damaging quote or some unhelpful public advice for his successors. Perhaps, though, he also senses that by putting Cruddas in charge of policy, Miliband might be repudiating not just Blair’s legacy but the entire New Labour project. Blair is now a Catholic, and Cruddas—the son of an itinerant Irish sailor and a mother who came to England from Donegal—once served as his aide and liaison to the unions, and speaks frequently of the importance of Catholic social teaching to his own political evolution. But the two men have been on opposing political trajectories for well over a decade. Cruddas is now a crucial member of Miliband’s brain trust, a group that also includes Maurice Glasman, an academic who coined the term “Blue Labour” to signify an appeal that blends respect for traditional social values like patriotism and family with a rejection of neoliberal economics; Marc Stears, an old Oxford friend of Miliband’s; and Arnie Graf, a veteran American community organizer who resigned from the Saul Alinsky–founded Industrial Areas Foundation and now spends every other month in Britain helping train Labour’s ground troops. The group meets regularly, and its members are in touch almost constantly. “I’m at Maurice’s house for Shabbat dinner whenever I’m in London,” Graf tells me. Like Cruddas, he was brought into the inner circle via Glasman, who led the Alinsky-inspired London Citizens campaign for a living wage before becoming Miliband’s first appointment to the House of Lords. A provocateur who was briefly banished last year for writing in the New Statesman that Labour’s new leader seemed to have “no strategy, no narrative and little energy,” Glasman likes to make pronouncements. “We’re city lovers,” he says of Blue Labour. Some of Glasman’s epigrams are miniature manifestos, as when he observes, “We give priority to the social over the state or the market. We believe in society—that’s why we’re socialists.” Others reflect long-simmering hostilities: “Communists are Litvaks with power,” he tells me on discovering, with delight, that we are both Galitzianers—Jews whose ancestors came from western Ukraine, long held in contempt by their more genteel Lithuanian co-religionists. But he can be irresistibly charming when he chooses. Eventually, Graf’s approach could turn Labour from a fatally compromised dispenser of patronage into a genuine campaigning organization. But in the short term, the challenge to the party’s traditional centers of power will need to be very carefully managed if Graf is to avoid the fate of Blue Labour, whose modest tilt toward a left-inflected populism was swiftly demonized as racist, xenophobic pandering. As an elected politician with his own base, Cruddas was always going to be the dominant member of this triumvirate. Yet it is his credibility and career, almost as much as Miliband’s, that are at risk if Labour fails to regain power—or if Labour merely regains power. Graf can always return to Baltimore. Glasman has the academy—and a life peerage. For Cruddas, there is only politics. Can Britain really shift from the emollient neoliberalism of Blair and Cameron to a different model based on mutual obligation, where prosperity doesn’t always trump equality? Has the financial crisis opened new possibilities for social and economic organization—or just left governments to referee the bankruptcy of the old order? Though Cruddas is circumspect in his language, there is no mistaking the radicalism of his ambition. Or his delight in being called back to the front line. “I never thought this opportunity would come around,” he says. “I thought it had gone.” We are sitting in Cruddas’s office in one of the more remote corridors of Portcullis House, across the street from the Palace of Westminster. On the shelves behind his desk, I see copies of Rawls, Marcuse’s Negations, Ernest Gellner, Trotsky, Marx and Richard Dawkins. How did he get here? “We were Irish-Catholic working-class Labour,” Cruddas says. “I joined the Labour Party; my brother joined the Carmelites. But I have a bit of an uncomfortable relationship with the Catholic Church—to say the least.” A product of Britain’s state-funded Catholic parochial system, Cruddas left school early and went to Australia, where he worked in construction. Eventually, he enrolled at Warwick University, graduated with a degree in economics, completed his master’s and then embarked on a PhD on “value theories in economics,” spending the two years after Thatcher won her third election victory at the University of Wisconsin. “I had a research fellowship at Madison, because I’d run out of money,” he said. “I took Erik Olin Wright’s Marxism course, and [Nation contributing editor] Joel Rogers was teaching it, so I went along and sat in the back.” Returning to Britain, Cruddas got a job in the Labour Party research department, “which was historically the battleground in the party between the left and the right.” Recruited onto Blair’s staff after Labour’s 1997 victory, Cruddas worked on Britain’s first national minimum-wage law and helped to roll back some of the Thatcher era’s anti-union legislation before leaving in 2001 to run for Parliament from Dagenham, a town built around what was once the largest Ford factory in Europe. “You could see the party becoming more orthodox; the energy was drying up. I thought it was time to get out,” Cruddas says. Dagenham’s story over the past half-century—from a factory workforce of 40,000 in the 1950s to less than 4,000 today—has been one of steady deindustrialization and decline. Yet the plant was also the site of the 1968 strike by women workers, dramatized in the film Made in Dagenham, that led to the passage of Britain’s first equal-pay legislation. By 2010, the far-right British National Party held twelve seats on the local council—until a campaign led by Cruddas and the anti-fascist group Searchlight brought about a complete rout of the BNP. It was one of the few bright spots in the election that brought David Cameron to power. All members of Parliament like to talk about their constituencies. For most, though, the local connection is simply a flag of convenience—a place to rent a flat, open a constituency office and spend as little time as possible away from the real business in Westminster. Dagenham may not be the center of Cruddas’s universe, but with its mix of immigrants lured by what he calls “the cheapest housing market in London” and working-class survivors from Britain’s industrial heyday, the town is never far from his thoughts. “I was at Dagenham Boxing Club last night, which is my favorite place in the world. It’s the most elite sporting institution I’ve ever come across; we’ve got future British champions. And it is the most socially inclusive model I’ve ever come across—drug rehabilitation projects, men, women, black, white. Last night, we had these real tasty Lithuanian kids. West African fighters. A bloke who is fighting for the British championship. This is the total Big Society,” he says. The sardonic twist at the end is a salutary reminder that Cruddas is no romantic. His job is to come up with a program and a set of policies that will win Labour the next election. In early April, the polls put Labour ahead of the Tories by 42 to 28 percent, with 12 percent for the Liberal Democrats and 11 for the UK Independence Party—the anti-European refuge for many disgruntled Tories. Which is where Cruddas and his policy review come in—and what makes this such an interesting moment in British politics. Thanks to the coalition government’s decision to fix the date of the next election in May 2015, the Labour Party has a luxury enjoyed by no previous opposition in British history: time to think. How will it use that time? Partly to answer Arnie Graf’s question: “What can political parties accomplish when they can’t make laws?” The idea is to open up a system designed to discourage participation by making politics relevant to people’s lives—which, initially at least, means making it local. Graf says that wherever he goes in Britain, people complain about the proliferation of payday lenders and legal loan sharks. “Some of the ideas we’ve come up with aren’t new, like collective switching”—organizing to buy gas and electricity as a group to save money and encourage green power. “But they’ve never been done by a political party before,” he adds. What might that look like? Speaking in Newcastle in April, Miliband promised to give local government greater power to crack down on landlords who overcharge or fail to properly maintain rental housing. He also said Labour would introduce compulsory jobs guarantees for able-bodied adults and young people, paid for by a tax on bank bonuses and by reversing the present government’s tax relief for high earners. He also pledged to set up a government-backed British Investment Bank to support small and medium-size businesses—which would also be given incentives for taking on new employees. In June 2010, Cruddas brought the audience at Compass, a left pressure group, to its feet with what remains the best speech of his career. Rejecting calls from one former minister to “crack down on the welfare underclass,” and from another who urged the party to talk tough on immigration, Cruddas said that to adopt a “kiss-up, kick-down politics that blames the victim” would be “political death for Labour.” Instead, he called for a “root-and-branch policy review”—the same review he now leads. More than just a change in policies, Labour, he said, needed a “cultural reformation,” which could only come about through a rediscovery of the party’s deep roots in English radicalism. Ask Cruddas about history, and his tall, stooped frame—which only a minute before had been drooping as he sleepily elaborated on the need to address “some of the architectural questions around bank reform and investment banking” (a coded allusion to trying to wrest some control over the economy from finance capital)—suddenly straightens up. “The history of the Labour Party is one long skirmish between two different traditions: the Independent Labour Party and the Fabians. The ILP were the romantic, anti-statist model built around human emancipation and self-realization, based on a reaction to capitalist commodification. And the Fabians, who basically won out in the 1930s, were the transactors, the lever-pullers, the owners of the calculus. And they’ve always won. The stakes for Labour—and for Britain—have never been higher. For the first time in a generation, politics here offers more than a forced choice between managed decline and blind fealty to the market. The outpouring of emotion in the wake of Margaret Thatcher’s death revealed a country every bit as divided as it was when she was still in power—and along much the same lines. We are, indeed, all Thatcher’s children—but perhaps now that she has finally left the building, we can move beyond the sterile arguments about Europe, the unions and the limits of state intervention that have dominated British politics for the past thirty years and consider instead what this country, governed in the best interests of all its people, might become. The intern’s name: Edward Miliband. D.D. GuttenplanTwitterD.D. Guttenplan is an editor at large at The Nation and the author of The Next Republic: The Rise of a New Radical Majority (Seven Stories Press).